You have in QuoVadis 7 “to track” the possibility of your own position of the Windows Phone to the Multitracking in QV-PU. The conditions which must be met are: You must use SkyDrive. With SkyDrive Windows 7 should be your operating system, since the integration with Windows Explorer works. Open QuoVadis 7 and contribute to multitracking properties of this file path. When you start SkyDrive now, the position is updated automatically at a set interval. In this example, every 10 seconds. You can also follow the shared positions in the QuoVadis 7 PowerUser. Therefore you need a separate tool, the QvCloudsDownloader, which ensures the synchronization of all shared positions with your local directory at your disk. 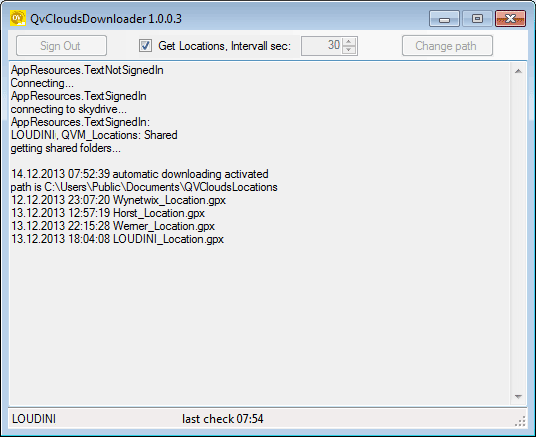 For the QvCloudsDownloader you need .Net 4.5, which you can - if not available yet - download from the Microsoft website and install it. 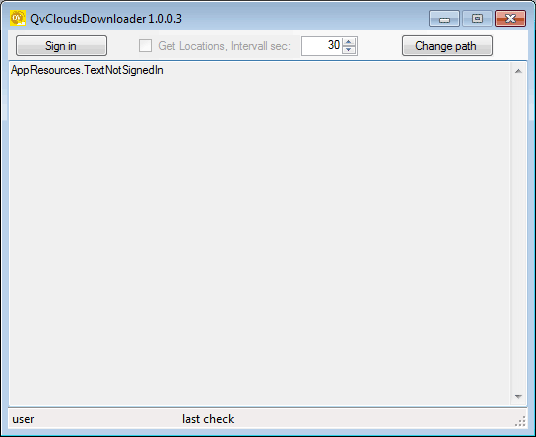 Start the QvCloudsDownloader and click the Sign In to log in. Then activate the button “Get Locations” to start downloading the “*_location.gpx” in a regular interval from the cloud to your local directory at your disk. Per Default the “Name_location.gpx” will be saved in the folder Shared documents\QVCloudsLocations - but always the newest position. You can also create a directory of your choice. Now the QvCloudsDownloader can be mimimized and synchronizes the status of the positions automatically and independent from QuoVadis 7. If all settings concerning the multitracking were correct, you will see the person, who is sharing his “Tracking” with you, in the map screen. You are able to create several entries with different names but maximum 5 positions can be tracked and saved parallel. If you prefer viewing more positions an additional license for QuoVadis 7 is available on request.